So what happened, you might ask. Well readers, the 1970's happened, 1974-75 in particular. I haven't done the math, but I would be willing to wager that downtown proper lost more buildings between 1973-1976 than at any other time in its history. 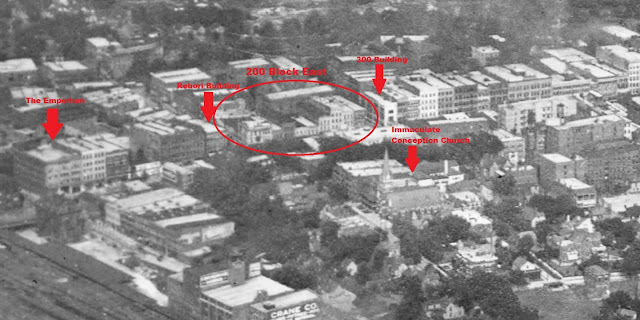 In those short years we lost the St. James, The Summit Apartments, the Commerce Street Fire Hall, the old Lawson-McGhee library, the rectory of Immaculate Conception Church, the Terminal building, one of the Victorian Southern Railroad office buildings at the Gay St. Viaduct, 3 buildings on Jackson Avenue in the Old City (now a parking lot across from Boyd's Jig and Reel), the entire 200 block of Gay Street on both sides, and on and on. Who could ever forget the infamous Treble Clef? In the last two posts, I was able to focus on the history of each individual property; the people that built it, their fortunes, their legacy. This time however, I'll be lucky to get in what used to be there, how it changed, and what happened to it. Why the change? Because, this post focuses on the destruction of an entire city block. That's seven buildings fronting Gay Street or the addresses 200 through 218. Every one of them came down in 1975. That's almost as ridiculous as what replaced them, a fiberglass treble clef! Who reading this blog has spent quality time in that tranquil park?......Waiting......Nobody? Well, I'm surprised, but I'm sure we've all traveled on the "traffic sewer" that is Summit Hill Drive. 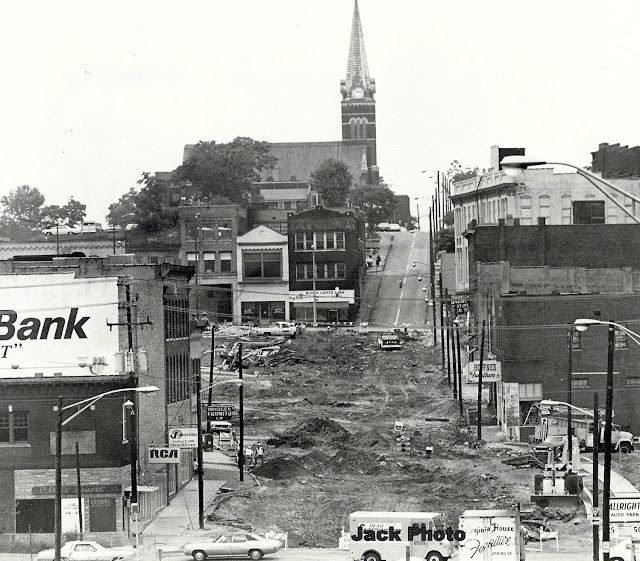 Let's talk about what used to be there before Summit Hill cut downtown in half. The 200 block was never anything terrible flashy. Back in 1880, there wasn't much on this particular stretch of Gay Street. The boom of commerce, tied to the railroad, hadn't yet filled the block. That would change between 1886 and 1890. By then, the whole block was full and would change little between then and 1975. The middle of the 200 Block, 1907, looking northeast. In the above photo, from left to right, we are looking at 210, 212, 214, and 216. 218, at the far right of the photo, was the corner of the block. We can see that 216 is occupied by Moore-Carpenter Hardware, next to it is Chapman Drugs in 214, the tallest building on the block. The next two storefronts, originally occupied by the George Brown Hardware Co. would come to be occupied by the Wright-Cruze hardware company. Every building in this photo was still standing in 1975, although they looked a little different. By 1919, Chapman Drugs had assumed the storefront occupied by Moore-Carpenter. 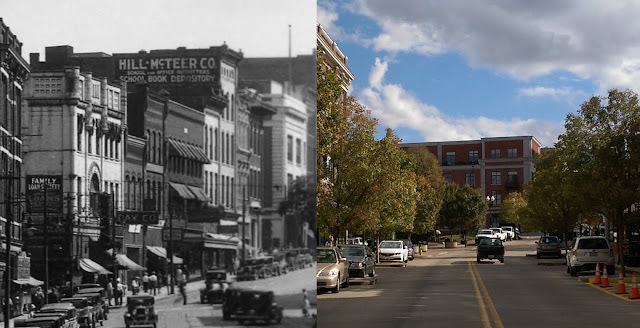 The corner building on the far right, 218, was being remade into the New American Bank after having been the Shield's Bros. Groceries and then The Gay Barber Shop and Turkish Baths. A little has changed, some businesses have grown. 200 Block, looking southeast. The Akron Tire Exchange has moved in to supply the growing population of automobiles. The new bank on the corner, is being fitted with a more appropriate facade. Work being completed by Chas. M. Allen Co (located in the Burwell Bldg.) using Atlanta Terra-Cotta. The finished product looking much more bank-like. Fortunately, the facade work for the bank didn't seem to bother the dentists upstairs very much. 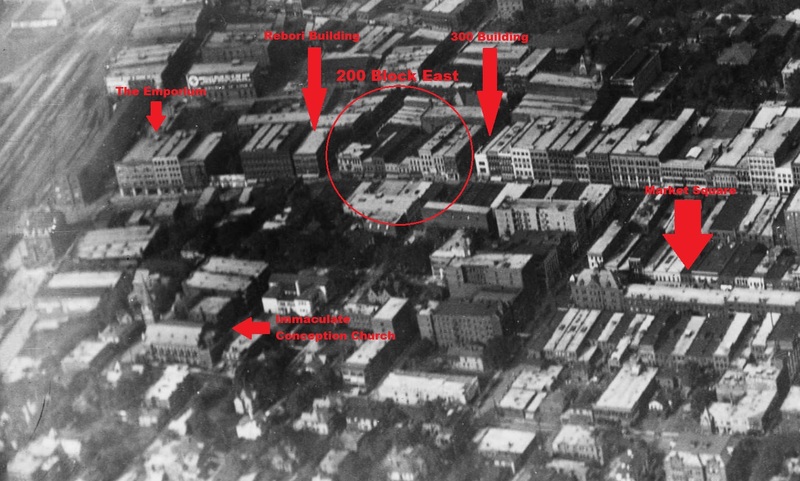 If you peer closely into the photo above, you are looking down Commerce Ave at the old fire hall and the ancient YMCA. Next door to the bank, Chapman Drugs was growing by leaps and bounds, touting their famous "White Lion" brand. Chapman Drugs at 214 and 216 S. Gay carried all kinds of things. Don't miss out on your De Soto Paints (wonder what happened to Lucas)! Chapman was very serious about the White Lion brand. Looking at Chapman, one has to wonder what happened to all of those lions? They may be decorating someone's yard today. Next door to Chapman, we had Wright-Cruze hardware, purveyors of Sherwin-Williams paints. Mr. Wright and Mr. Cruz at their desks. Wright-Cruz, 212-210 S. Gay St.
Notice at the northern end of the above photo, there was an undertaker conveniently down the street if those White Lion drugs didn't work out. As you can see, the 200 block was comprised of buildings not unlike those you'd find on the 100 block today. They were solid brick shells with wooden joists, two to four stories tall, all in the Victorian vernacular. All except one, the one at the corner of Gay and Vine. Directly across Vine Ave from the Rebori building was an interesting looking structure, built to house a bank at first. Much has changed by the 1920's. Looking South on Gay St. In the above photo, we can see the 200-202 building, a beautiful, castle-like place. Originally purposed for the Knoxville Savings Bank from around 1890-1917 or so, it would house one of Knoxville's more familiar businesses, Diftler's Jewelers. 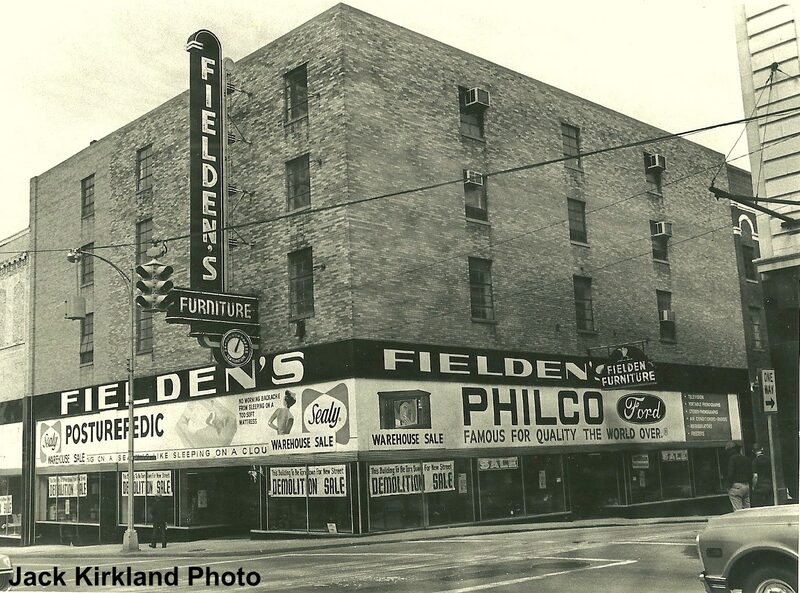 Founded by cousins Benjamin Diftler and Max Friedman in 1922, Diftler's would be in business until Nathan Diftler decided to retire in 1998 (the store ended up on Market Street in the Arnstein Building). 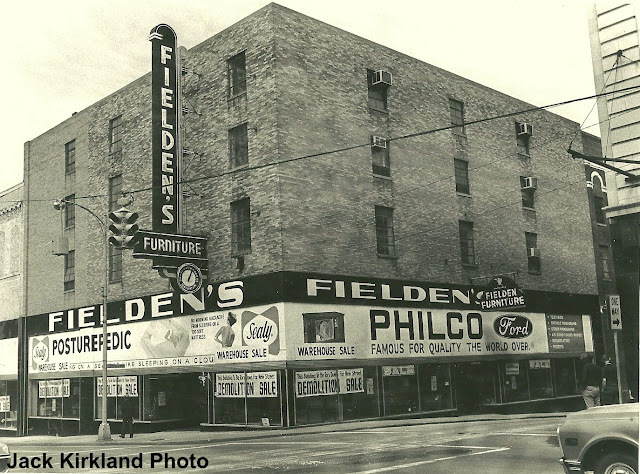 Diftler's moved to Market Street in 1965 leaving that space vacant for the next decade. It is no coincidence that Friedman and Diftler would set up in this section of town, as it was then known as the Jewish district. There's a great article about that by Jack Neely here. Next to Diftler was Day Co., a loan company. You can see the sign for Family Loan Society, signaling the beginning of what most living Knoxvillians know this block for, loan and pawn shops. Looking north on Gay, 1930's. By the 1930's, we can see the impressive Sterchi Building has gone up in the background. In this photo, American National Bank is on the corner at 218 The Chapman Drug company is no longer doing business on the block, leaving one vacant storefront and another has been filled by Westinghouse Appliances. Cruze hardware is still there, but next door the Knoxville Outfitting Co. has put up a new building to replace those at 210 and 208. At 206 we find Uncle Moe's Paw followed by United Loan at 204. United would move to 206 later, to be replaced by Busch Loan. On the corner, in 202 we find Dixie Loan and then Diftler's at 200. Dixie, Busch, and United would be there until the end. Looking south at the 200 Block. By the early 1960's, much had changed on the 200 block. Two stories had been removed from 200/202, taking it from the most interesting building on the block to the least. 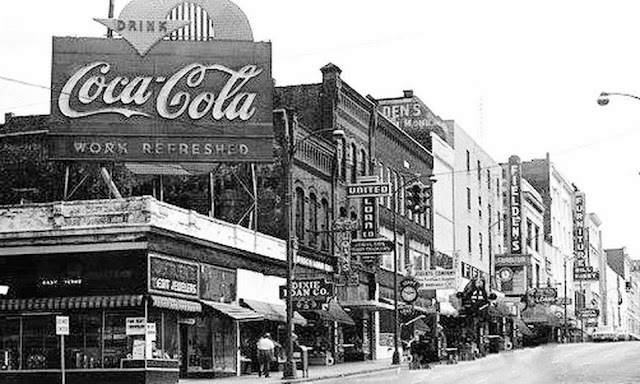 One icon that Knoxvillians of a certain age will remember was the giant, flashing, Coca Cola sign that replaced the upper floors. Dixie, Bush, and United Loan are all still there. Knoxville Outfitters was replaced by Maxwell Lester Furniture in the 50's and then Roberts Co. Office Furniture by the time this photo was taken in the 1960's. Next door Fielden's furniture has expanded to include 212, 214, 216, and 218. The last three addresses were all combined into one common facade. Later, 212 would be home to the Gay Street Cinema Theater in the 1970's. This is the 200 block as most living Knoxvillians remember it. 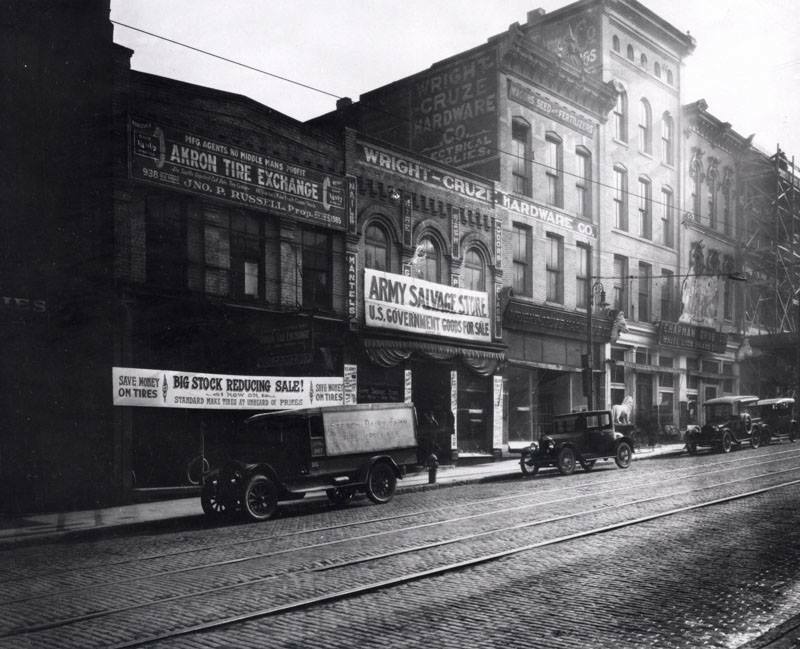 While not the most glamorous block in town, the 200 was still thriving commercially as it had since the 1890's. All that was about to change. As early as the 1950's, different proposals had floated around for an east-west thoroughfare through downtown. An east-west mall was proposed for the 700 block, but a modern, fast roadway was claimed to be needed for the northern part of downtown. 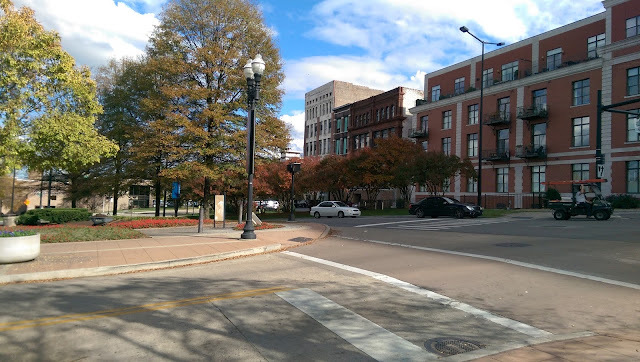 Several designs were put forth over the years, some as simple as making Commerce Street one way and Vine the other way, some proposed widening one of those streets. The most destructive route, however, proposed a wide, curving boulevard through the very heart of the north end of downtown. Guess which proposal won. Cas Walker was completely, as was his bent, against the new roadway. He said that any improvements would be better left to private investors. The Eagles Club, represented by now Tennessee Court of Appeals Judge Charles Susano, also took a stand against the proposed roadway. Famous attorney, John O'Connor represented the Catholic Diocease of Nashville, owners of Immaculate Conception Church, against the roadway as it would cost them their historic rectory and bring the road right up against the church. On the other side was Rodney Lawler, executive director of KCDC who was pushing the plan. KCDC still owns much land that was acquired in the 1970's for this project. Mayor Kyle Testerman broke a 4-4 tie vote on city council to approve funding for the project. On October 17, 1974, reports hit the newspaper that there may have been collusion between private developers, who had acquired land only to turn around and sell it to KCDC at a profit, and public officials. At the end of 1974, a vote was taken in city council for final approval and the plan was defeated! Whew! That was close, or was it? In January, 1975 the plan was put back on the council agenda. This time it passed 5-3 with two councilmen changing their vote. The plan was in place and funded. The properties were acquired, the bulldozers came in, and the rest is history. So that's what happened readers, a grand scheme to renew downtown (or a boondoggle for developers, you chose). We were left with a large road that bisects the downtown district and a largely unusable park. Here's the way it looks today. Looking North from the 300 Block. Looking South from the 100 Block. The great void where once stood the 200 block. And now for some requisite aerial shots. And that is what happened to the east side of the 200 block. As you may imagine, the west side suffered the same fate. We'll take a look at it next time in the Gaps of Gay Street series. Excellent post backed up with with lots research and photographs. The aerial photos highlight the huge chunks of Knoxville that are now missing. Thank-you! Thank you for delving into the history of the 200 block of Gay Street, something that is a mystery to most Knoxvillians. There are lessons to be learned here, not just from the obvious story of the loss of buildings during a period when urban came to be a dirty word, but from the misguided and short-sighted reasons for doing so. I keep hoping we've learned those lessons. 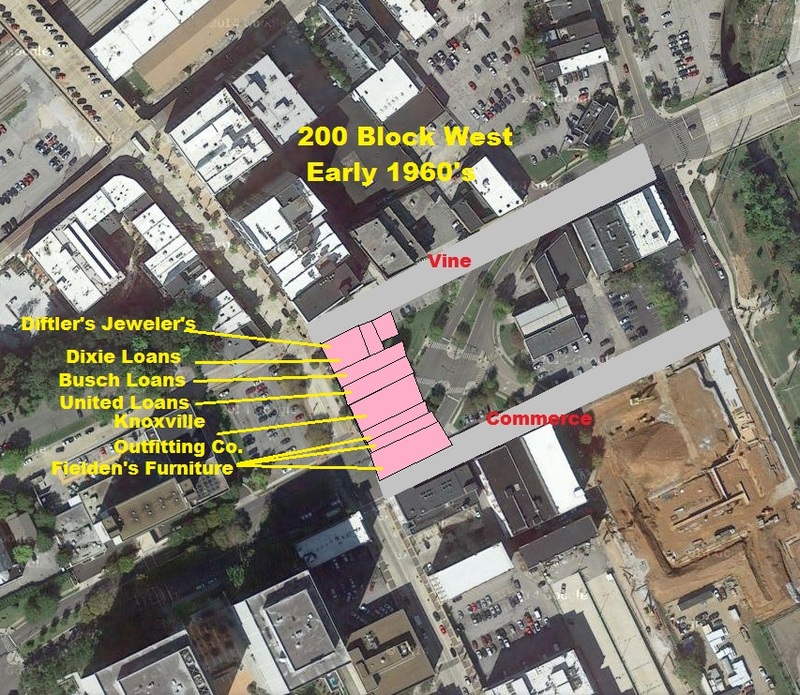 Looking forward to what you are able to gather on the west side of the 200 block. Both sides of this block currently represent one of the most appalling wastes of space in downtown Knoxville. Great piece of research. Coincidentally I just walked by this block twice with my wife today before looking at your latest blog and seeing what was missing. Minor correction: Gay Street Cinema was located at 215 S. Gay St., on the west side of the street, not at 212. My grandfather was the VP of the investment company that owned it. Regardless, thank you for such a detailed and we'll written piece about the history of Knoxville's most historically valuable road.